Good news, Pro Tools fans. Pro Tools LE (supported by the 002 and Mbox/Mbox2 audio hardware) and Pro Tools M-Powered (which runs on a wide range of M-Audio hardware) are now Intel Mac-native. Given what we’ve seen from Ableton Live and Apple Logic Pro, you should see some impressive performance out of Pro Tools on Apple’s latest iMacs, MacBooks, minis, and MacBook Pros. 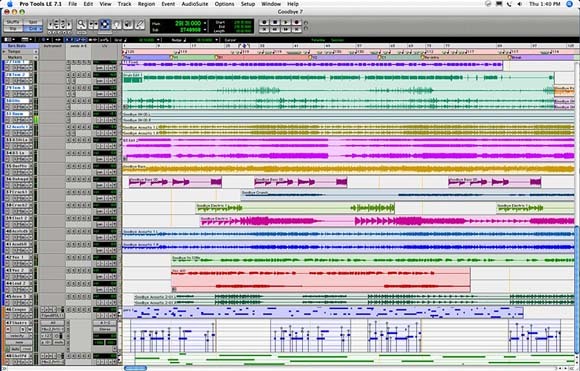 Pro Tools 7.1.x offers more than just Intel Mac support. 7.1 supports the new Music Production Toolkit (though it’s news to me that the last release didn’t). Confusingly, LE supports the DV Toolkit 2, but M-Powered doesn’t. Digidesign has also added to the supported M-Audio hardware for Pro Tools M-Powered, as well, with the Audiophile USB, Fast Track Pro and JamLab. The Fast Track Pro is an especially nice portable interface, with an assignable headphone jack. There’s also new quad G5 Mac support, though I don’t know whether or not Pro Tools is multithreaded enough to get much of a performance boost there versus the dual G5. The other good news: this could be a free upgrade. Digidesign isn’t charging for the upgrade if you have Pro Tools LE/M-Powered 7. (If you have LE 6.9, you’ll have to pay to upgrade to PT 7 as always.) That’s in contrast to other developers, who have largely been charging (admittedly nominally) for Intel Mac support.